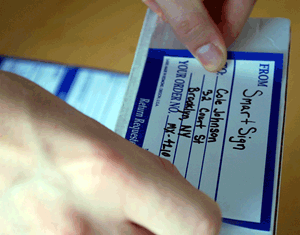 Give envelopes and packages a professional look with Address Labels. Peel-off liner and permanent acrylic adhesive is great for rough surfaces. Self-adhesive address labels stick neatly to cartons and drums. Simply write in the blank spaces provided. • Affordable, stylish matte paper comes in rolls of 500. • Write on labels with a pencil or ballpoint pen. You can also print the address with a thermal printer. • Choose any color and pattern below to get started. Great for organizing package schedules and speeding up deliveries.